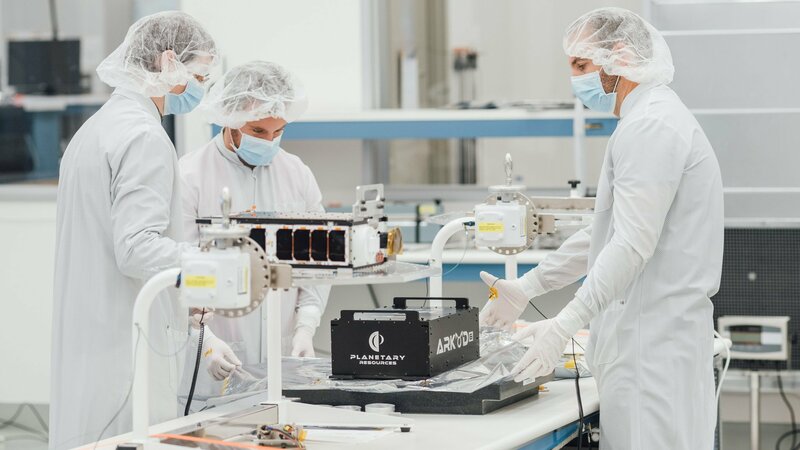 Planetary Resources’ Arkyd-6 Spacecraft is assembled and tested on a Flotron 212 Benchtop Rotation Fixture and then inspected in the cleanroom at the Redmond Washington facility. Arkyd 6 will test systems that will be used in the Arkyd 200 asteroid exploration mission with a target launch date of 2020. The first target asteroid resource will be water, which can be split into hydrogen and oxygen using solar energy and used as a fuel source for spacecraft. Luxembourg recently offered a legal and regulatory framework relating to the authorization, supervision, ownership and utilization of valuable space resources identified and extracted on celestial bodies by private operators. Flotron’s 212 Benchtop Rotation Fixture has a 130 lbs load rating considering SFy = 2 and SFu = 3. The gearbox is self-locking and non-back-driving and is sealed and pressure tested. Trunnion lock knobs on the end frame bearing housings eliminate backlash in the system. Additionally, a 15° index plate can be physically pinned to the vertical upright to lockout the rotation axis. Standard interfaces include either mounting plates or angle mounts. The “C” finish option is compatible in a CLASS 1K clean room environment. The end frames are powder coated gloss white and the gearbox is wet painted gloss white. All of the moving parts and hardware are either electro-less nickel plated or stainless steel. The lubricant in the trunnion bearings is Krytox-GPL207, however can be replaced with Braycote 601EF or other customer approved option. An ESD ground lug can be utilized for compatibility in electro-statically protected areas. Learn more about Flotron’s 200 Series Benchtop Rotation Fixture product line.